Photos and text by Robert Kokenyesi, Ceramic Artist at beachfront Pottery, Godfrey IL, USA. 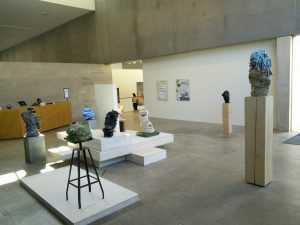 From January 16 to April 3, 2016 a very special exhibit took place at the Contemporary Art Museum in St Louis; link is here (http://camstl.org/exhibitions/main-gallery/arlene-shechet). 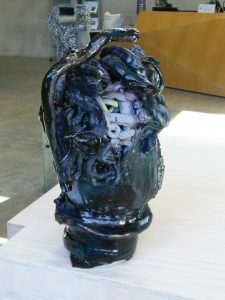 The exhibit was special, because the pieces represented Arlene Shechet’s last several years’ worth of ceramic creations. You wouldn’t know from the brochure, but by listening to Arlene’s interviews it’s clear that we are looking at the survivors of her ceramic sculpting. Admittedly, she destroys the pieces that seem to go nowhere. On the wall to the right you see two paper-based pieces from Arlene; I will not review those. The curator did a great job with the arrangement of the pieces. The only thing I was missing is the titles of her pieces. 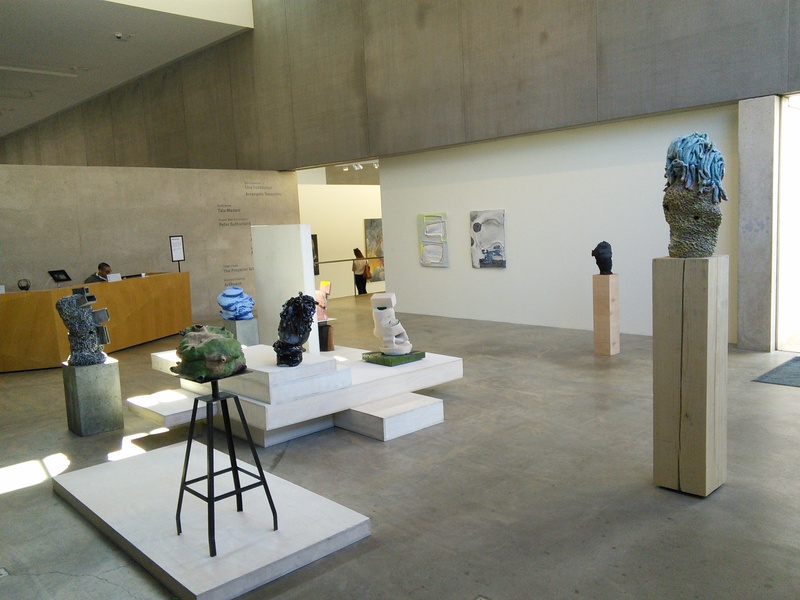 The CAMSTL exhibit brochure had two pieces named, but the pedestals were totally without tags. She worked in several media before turning to clay as the starting material. From my point of view, her ceramic work is a wonderful representative of the process-driven creation. 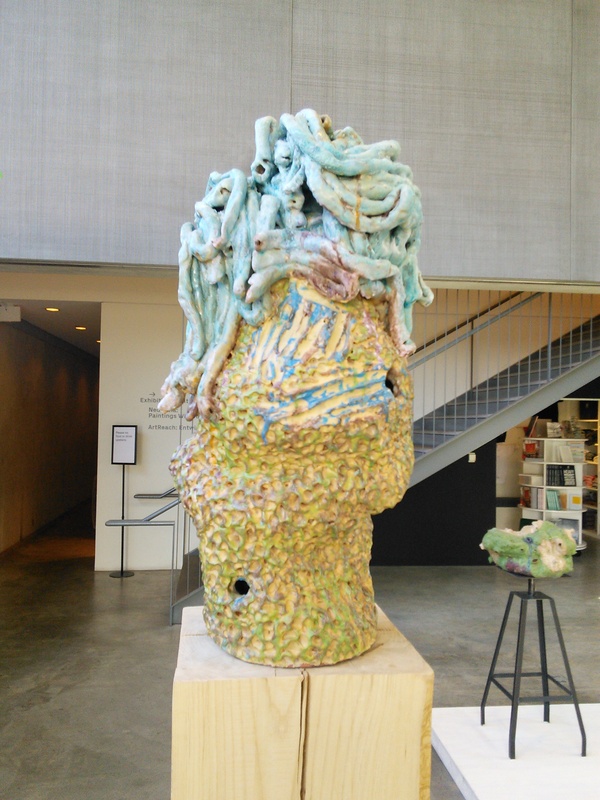 She starts out without drawing or preconceived ideas, and builds her pieces from formed clay, kiln bricks, and kiln furniture. 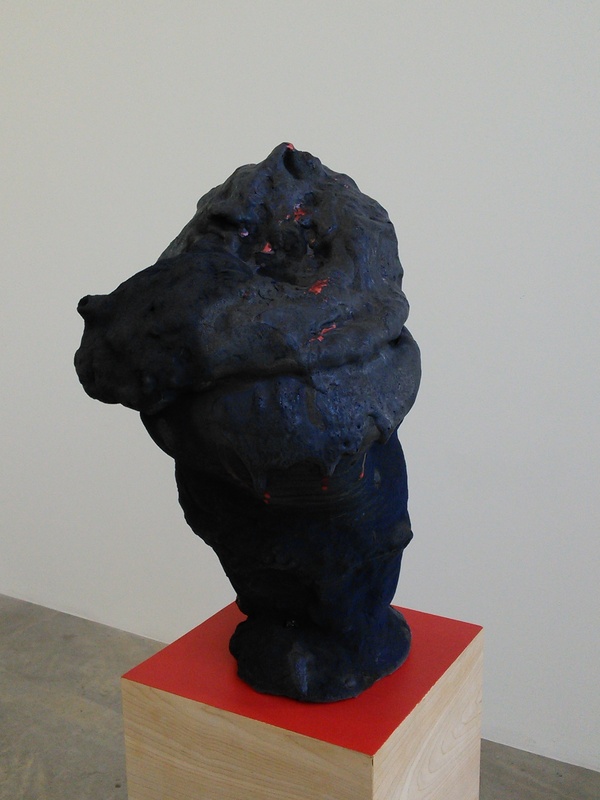 The titles of her pieces (as many as I could gather from the web) express the guiding impulse behind the process. It’s interesting the it takes her 6-9 months to build these pieces, so she maintains the originating impulse for that long. Arlene mentions in several interviews that a characteristic of ceramics is that they’re hollow, and, so the breathe. On the outside of all pieces you can observe the openings that connect to that hollow core of the piece. This piece is about two feet wide, and one foot tall. Reminds me of the many soft sponges I’ve seen in my scuba diving days in Florida. It was very easy to convince myself that it must be soft to the touch, and must have a rubbery texture to it. The base is a four-legged barstool looking support. Would have been exciting to read Arlene’s inspiration for this piece! 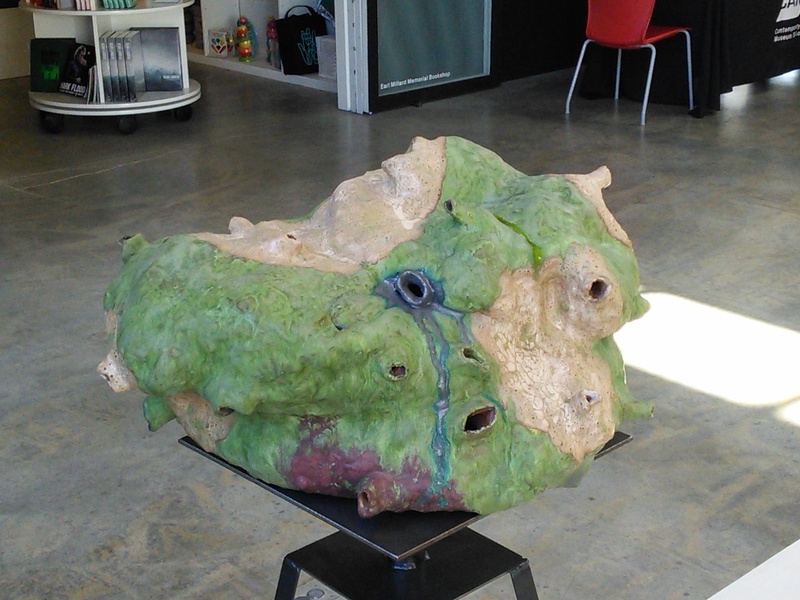 This piece was placed on a 4-foot tall split wooden beam base. The bottom 2/3rd of the piece looks like it made of thousands of squished together clay pieces. At some places you can see Arlene’s finger tracks as she was shaping the clay. On top is a the balancing act you see on many of Arlene’s pieces. 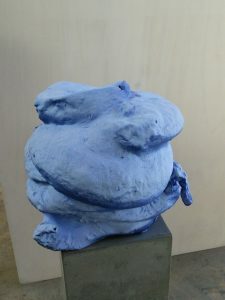 Hand-formed clay pieces (in this case a bunch of curled tubes) are placed on top of each other to achieve a very imbalanced, lopsided, ready to topple over amalgamation. The ceramic part is about 4 feet tall. Would have been exciting to read Arlene’s inspiration for this piece! I liked the “Night Vision”, because it is a very complex piece. 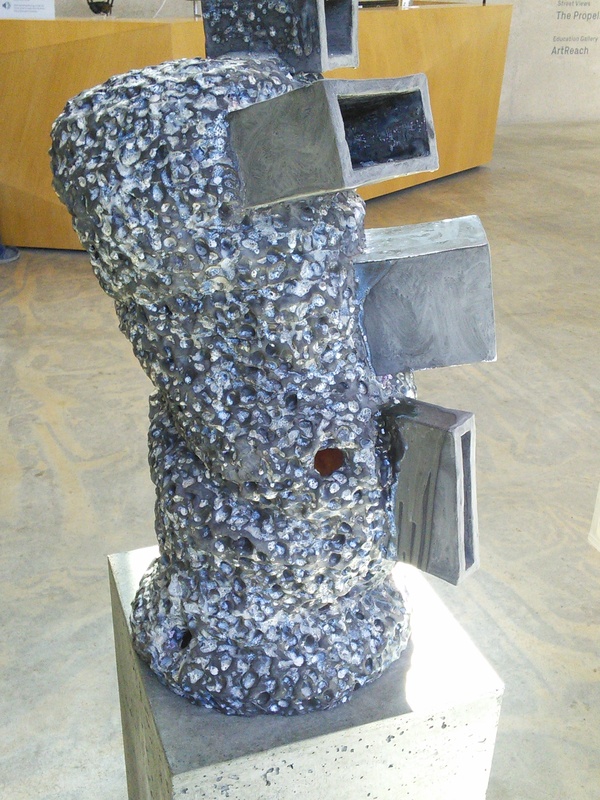 The tube-like components are largely inside the piece as opposed to the top on the “Idle Idol”. In addition, there’s a glaze color and texture that shows up only if a piece is fired multiple times. The ceramic part is about three feet tall. The base was a flat piece of plywood which was a part of a set of cascading stair-like structures. I couldn’t decide if the “One and Only” piece was glazed black or very dark blue. However, it was quite clear to me that there was a menacing quality to this piece. Perhaps the red (almost glowing) spots (matching the color of the top of the base) made me think Dart Wader. The ceramic part is about three feet tall. Would have been exciting to read Arlene’s inspiration for this piece! Because I used to work at Saint Louis University, this piece reminded me the Billiken mascot. Blue, chubby, ready to roll over. This piece was a great illustration of the gradual building process by Arlene. You can pick out the bulging layers as they were added one on top of the other in the slow building/balancing creating process. The ceramic part is about two feet tall and wide. The base is a dark grey concrete slab. Would have been exciting to read Arlene’s inspiration for this piece! I don’t have the title of this piece. There was a very discernible rash-like raised/pointy surface texture all over this piece. Great example of incorporating kiln bricks and kiln furniture into a piece. The ceramic part is about three feet tall. The base is made of green-glazed kiln bricks. Would have been exciting to read Arlene’s inspiration for this piece! I don’t have the title of this piece. 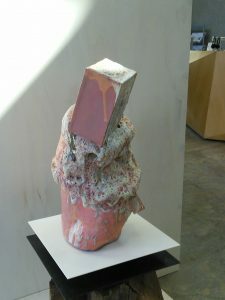 This piece was dominated by the bricks and pinkish glaze. Another great example of incorporating kiln bricks and kiln furniture into a piece. The ceramic part is about two feet tall. The base is made of a sheet of painted plywood. Would have been exciting to read Arlene’s inspiration for this piece! I don’t have the title of this piece. There was a very discernible mottled surface texture all over this piece. Another great example of incorporating kiln bricks and kiln furniture into a piece. The ceramic part is about three feet tall. The base is made of light gray concrete slab . Would have been exciting to read Arlene’s inspiration for this piece! For Arlene the base (pedestal support) is an integral part of the piece. According to her audio statement there’s no hierarchy when the base and the ceramic piece is concerned. 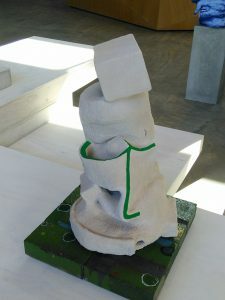 Moreover, the base contributes to the individual nature of the pieces. In one online interview she states that the individual inspiration that makes her work the piece is so unique, that she never makes a series or a body of work around a single motivating impulse. It’s tough to get the full specter of the piece arrangements, but you can get a feel for it on the first photo in this blog, and on the photo . 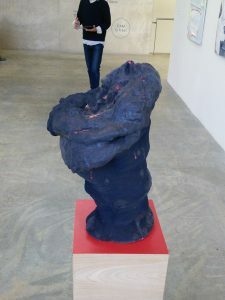 This seems to me to add a third layer to the exhibit, with the first layer is the ceramic creation, the second being the base, and the third is the arrangement of the pieces. Arrangement here is not just the configuration of each piece, but the incorporation of raised, stair or stepping stone-shaped wood structures. Octopus escapes; wouldn’t you if they called you Inky?